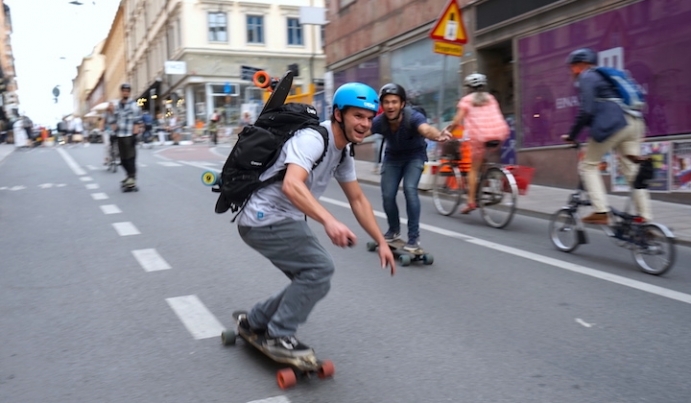 Waterproofing is a big deal for battery powered vehicles like electric skateboards. E-mobility is for everyday but the blue birds and the sunshine don’t always schedule an appearance, so batteries and electronics need protection against the elements. Here at Mellow we made it our goal to toughen our drive against whatever roads and nature decide to kick and spit at it. Read further after the video below, as Mellow’s head engineer, Kilian Green adds a few more insights and answers to other questions we've received about waterproofing of the Mellow Board and the remote that controls it. How did Mellow do IP65 waterproof testing?During development, Mellow and TQ did real world wet rides - sometimes even in the ice and snow - in addition to continuous lab testing. Official IP65 certification consists of a 15-minute long test using an automated system to spray multiple jets of water at all angles in a complete 360 degree circle with the Drive was positioned so that water could run off, as per IP65 specifications. Water-sensitive materials were placed inside the Drive in order to reveal if liquid penetrated the housing or Gore-tex membrane. How should I maintain my Mellow after riding dirty (or wet)? Standing water in your Drive is comparable to immersion, so prop your board up vertically, pop the battery out, and dry all surfaces possible, making sure that in particular the battery plug and jack are dry before re-inserting. Store in a dry place. Be careful if you have a wooden deck: water can enter through the truck mounting holes, dings and scratches. Skate bearings are not rated IP65 or covered by our warranty, and are easily and quickly damaged by water ingress, so they should be maintained accordingly. Can I ride in the rain without the battery? No, without the battery clicked in the connector on the frame is only “splash proof” (IP64). Only Mellow Drive with a correctly-inserted battery is IP65 waterproof. If my Mellow accidentally gets submerged, what should I do? Sticking your Mellow electric skateboard in a big bag of rice is not a practical nor particularly effective solution. Instead take out the Battery Pack immediately, dry both the Drive and Pack with a towel, and let stand for at least a week in a dry and warm place. Do not try to take apart or open any part of the Mellow Drive since this will not only void your warranty, but break the waterproof seals. As noted above, your bearings are not waterproof and should be maintained accordingly. Bearings aren't waterproof, what can we do to maintain them? Greasing the bearing on the outside is a good solution to avoid rust. The outer 608-sized bearing should only be replaced by sealed grease-filled models with protective shields on both sides or else the waterproofing will be compromised. Diamonds are forever, what about your water seals? Unfortunately, the materials used to seal the Drive are flexible and rubber-like and are thus subject to degradation, lasting a minimum of 2 years. What can a rider do to make seals last longer? Opening, immersing or damaging the Drive, battery or remote will compromise waterproofing, so avoid such cases. Water must always be allowed to run off the Drive. Riding through a long deep puddle of even half an inch is similar to complete immersion after a certain amount of time. Do not puncture the Gore-tex membrane used for venting pressure as this will void your warranty and permit water to enter: one is located under the "push" tab on the battery and the other on the top surface of the Drive (see photo below). Some waterproofing only protects when the board is stationary, what about Mellow? Yes, our tests and certification were done with the assumption that the rider would be riding in the rain, not doing non-traditional skating activites such as...taking a shower. Keep informed of future blog entries on testing, safety and certification by subscribing to the Mellow Times.